For most people, brushing their teeth is relegated to their own personal bathroom. But since your day might involve a variety of locations, why limit your brushing to just one? With the right travel toothbrush, you’ll be comfortable brushing your teeth in your bathroom at work, during a break at your college, or other places where you spend your time. Discover why a travel toothbrush may be the key to brightening up your smile. While it’s true that standard toothbrushes take up very little space, most travel toothbrushes take even less than half of that. This makes them extremely portable, which is their main selling point. Aside from that, you’ll notice that travel toothbrushes can be pretty creative in their design, with some folding out like a jackknife and others sanitizing themselves via a USB drive. Whether you plan on stashing it in a desk drawer at work or you want a toothbrush that fits into the smaller pockets of your backpack, a travel toothbrush is just the thing to ensure that you can take care of your teeth anywhere you go. For a toothbrush that packs everything you need in the palm of your hand while looking sleek doing so, look no further than the Ohso Marko Chrome Toothbrush. The biggest advantage of the Ohso Marko toothbrush is that it allows for a travel-size tube of toothpaste to be attached in its handle. This means only having to remember to bring one thing instead of two, which can be a source of motivation for a lot of people. Electric toothbrushes can be excellent for travel too, as shown by the Slim Sonic Toothbrush by Violife. With a sleek, slim design, and a cylindrical carrying case, the Slim Sonic Toothbrush packs all of the power of a typical electric toothbrush but stores easily and is highly portable. Powered by AAA batteries, the Slim Sonic will help you keep your teeth clean, wherever you may be. What better trait is there in a travel toothbrush than not needing toothpaste at all? Such is the case with the Solar Powered Toothbrush. Using similar solar technology found in calculators, the Solar Powered Toothbrush actually sanitizes itself using electrons. For a rare toothbrush that you can literally use anywhere, even in your favorite park, try the Solar Powered Toothbrush by the Shinken Company in Japan. Some people are so busy that they might forget a brushing session on account of not being around to use their toothbrush. If you’re one of these busy people, then consider a travel toothbrush that suits your style. With a travel toothbrush you like, you can brush your teeth in new locations, places you find yourself throughout the day – and of course, your smile will thank you. 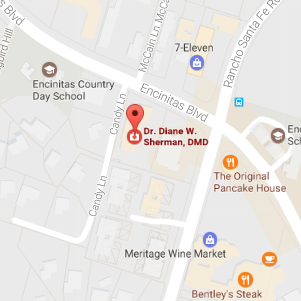 Contact Dr. Sherman when it’s time to schedule your next dental appointment.